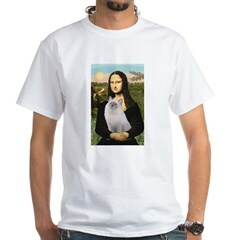 Different styles and breeds available from CafePress artists. 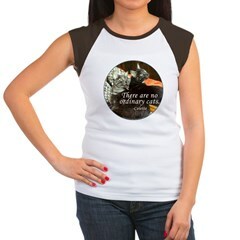 Most come in a selection of sizes and colors that you can choose from before you buy. Have fun! 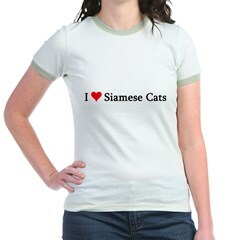 Do you love Norwegian Forest cats? If so, then make your statement with these products! 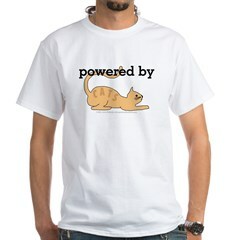 An ideal gift for any cat lover, features an Orange Tabby Cat. 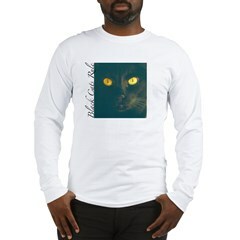 A montage of Mela's favorite cats on a T-shirt for you. I love my cats more than most people. 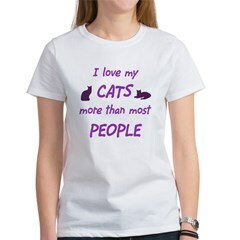 And by that, I mean that I love cats more than I love most people! Makes a great gift for the crazy cat lady in your life! 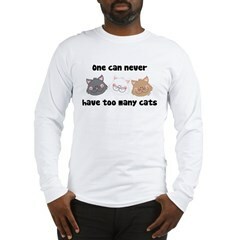 One can never have too many cats. Three cute kitties with big cat smiles. And original design by JGoode. Kids are for people who can't have cats! Or maybe your children are grown, and your kitties are your babies now. Humorous shirt for cat lovers. There are no ordinary cats, as Colette aptly said, and our beautiful mixed-breed grey smoke tabby (and formerly starving stray kitten) graphically demonstrates. Show your love for cats! 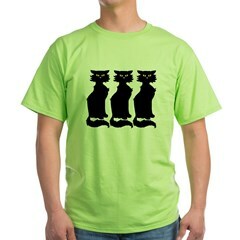 The design was inspired by 3 lovable cats. Do you love Manx cats? If so, then make your statement with these products! Love me...love my cats. Yes, we're a package deal. 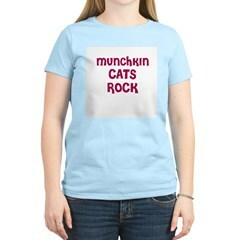 Shirts and gifts for those who really love their cats! Three black cats, all in a row, keep you company here! Powered By Cats: They wake you up in the morning, they purr on your lap when you're tired, those furry little felines give us the strength to deal with people every day. 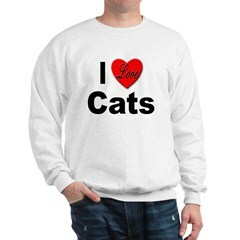 I Love Cats. Do you? 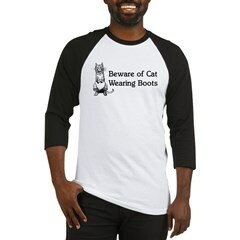 For cat owners and pet lovers! 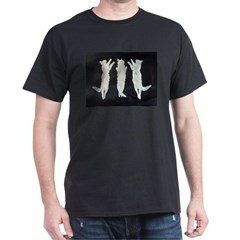 This black and white artwork of a dancing cats is the perfect gift for anyone for any occasion! Black Jaguar - Panther - Wild Cat - by Deleas Kilgore. These fun cats are playful and very shifty. 3 Lavender Cats, Kittens Whimsical cat folk art from the Blessing Art Series. S. Fernleaf and Nearholy Studio. Copyright 2005. These fun cats are playful and very shifty. 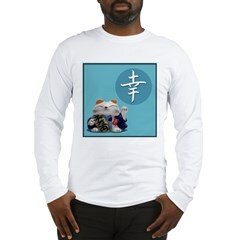 Keep warm on cool nights with these felines! I Love Cats for Cat Lovers. 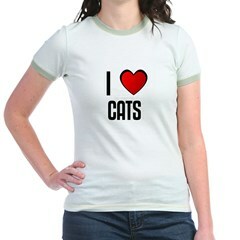 I Heart Cats. Passion for Cats. 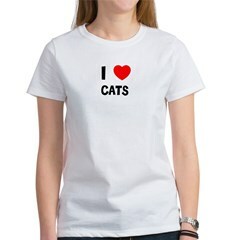 Show love for Cats. Go Cats! Cats rule! Fun Christmas designs to lighten up the heart of cat, animal, and nature lovers. 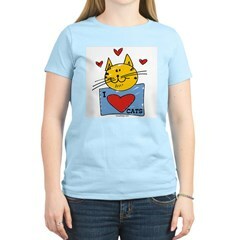 Most designs star a beautiful blue-eyed ragdoll cat who loves to be photographed! Mona Lisa and her Blue Ragdoll cat. 3 Orange Tabbies, Tabby Cats Whimsical cat folk art from the Blessing Art Series. S. Fernleaf and Nearholy Studio. Copyright 2005. If cats could talk.... they wouldn't. If you love cats then this is a beautiful way to show it. Vividly colored cats are a must on this sweatshirt! I love silver persian cats, featuring a heart shaped silver persian face. 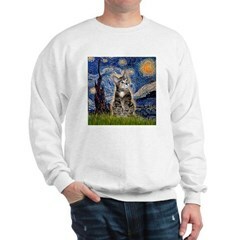 Starry Night with a short haired tiger cat added. William Heath Robinson's 1921 illustration for Puss in Boots with Beware Cat Wearing Boots message. When possible, a quote from the tale and the SurLaLune logo appear on the back. 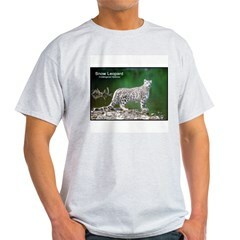 Snow Leopard Photo for Leopard, Wildlife, Endangered Species, Nature Photography, Big Cat and Animal lovers. Snow Leopard Photography. Go Snow Leopards. Vintage retro cat design for the classic cartoon lover. 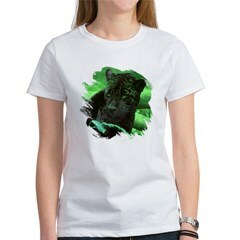 Design features a texturized grey tabby cat with green eyes and a pink yarn ball. 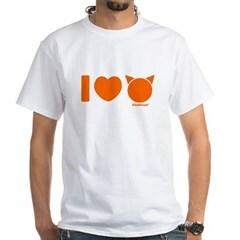 Wording: I Love Cats! 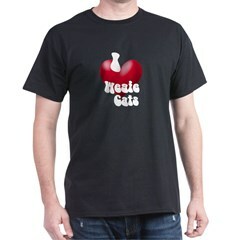 Red heart & paw prints on the back. 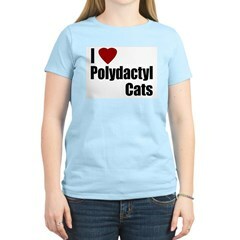 Great gift idea for the cat lover. JillyJax Pet Art. Cats are Cool features a cute image of a kitten in line drawing format. Eyes have color. The text features eyes in the 'a' and 'o' letters, and is painted in 'rust tiger cat' coloration. 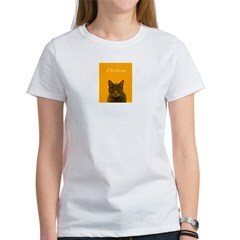 An ideal gift for any cat lover, features an Orange Kitten.